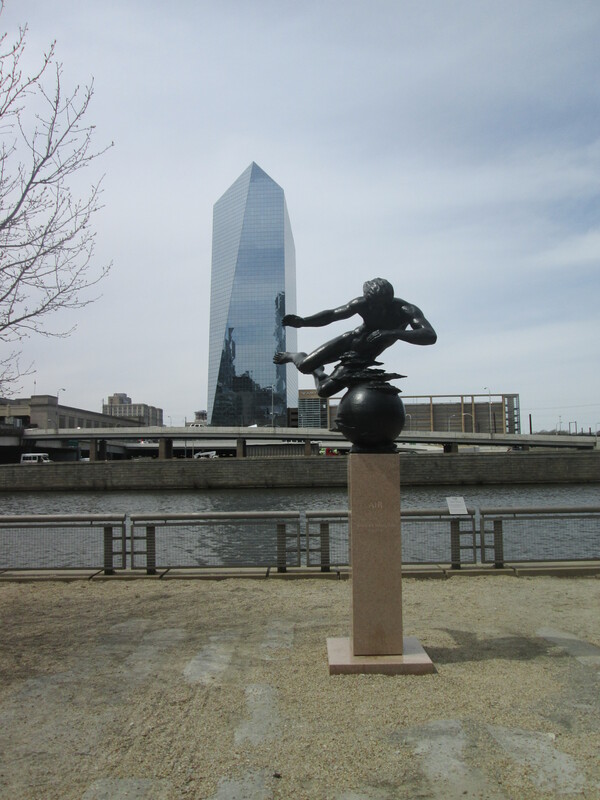 We went for a leisurely 50 km ride this morning along the Schuylkill river trail. I wish I could be cycling on a similar trail every day. It was so nice being next to the river. It was such a beautiful spring day. Loads of trees were blossoming as we went through parks, past boat sheds and spotted rowers on the river. 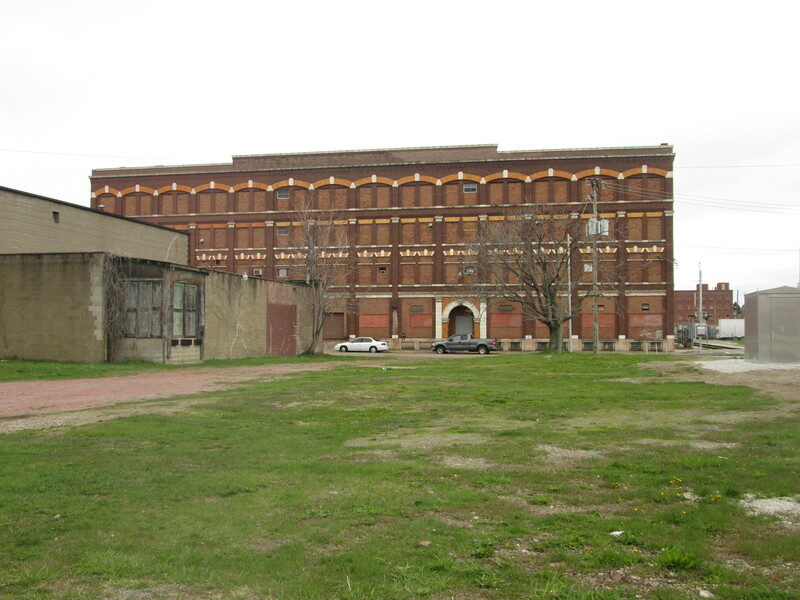 There were many old brick factoriess and old warehouses now abandoned and in decline. There was a destroyed lock no longer working. Parts of the trail were actually the old railway line. We stopped for coffee in Manayunk a nice old one-street town. Well the day has finally come to Tim’s horror as my plan or lack of it has him a little worried. North West was my only real plan. Tim has now kindly given me a map and a bit more of a plan. 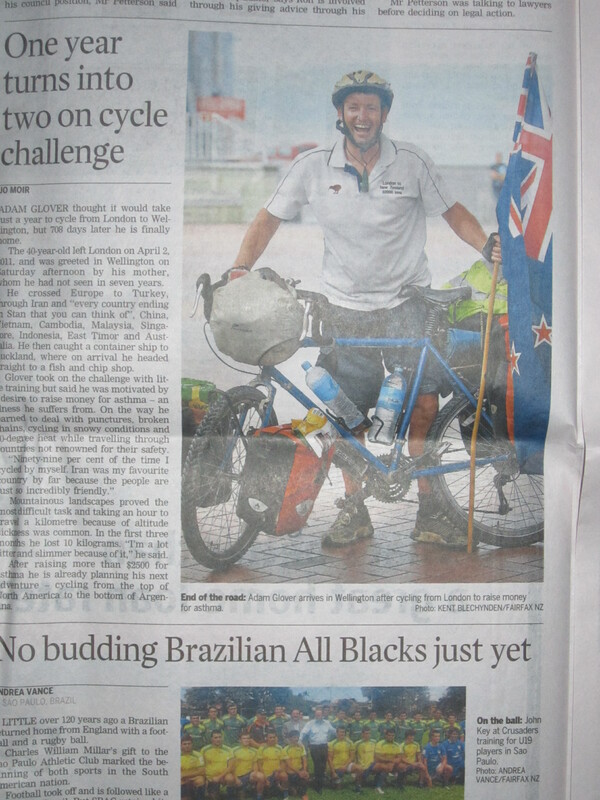 He is also going to cycle out with me for the first 50 km to help me safely navigate my way out of the city. 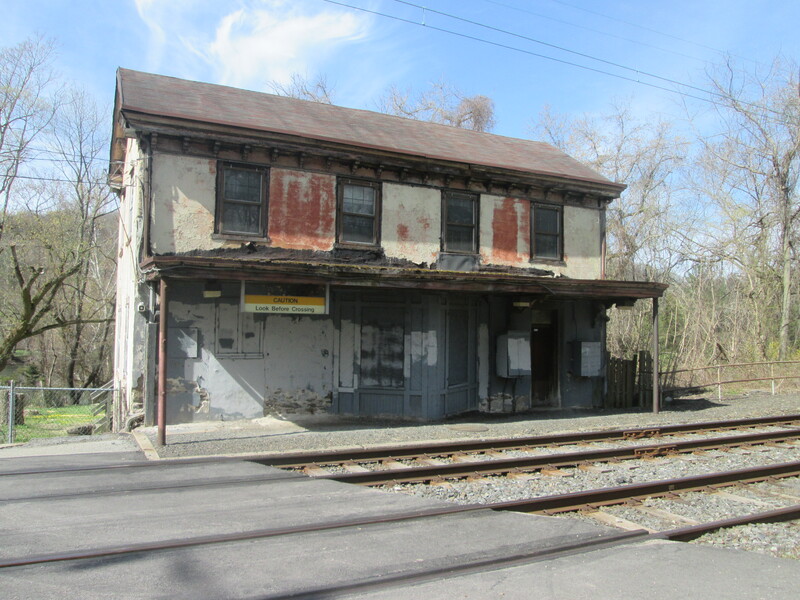 It was a perfect warm sunny day to be cycling out of Philadelphia. I think I have timed my start perfectly. I was told the previous weeks had been terrible. We cycled out through the rundown part of town. Mostly red brick, very English looking houses from the turn of the century. As we got further out, the houses turned into 3 storey mansions. I noticed not many had a garage. We were very soon in the countryside. The road became very rolling and went through small forests of leafless trees. After 50 km we stopped in West Chester. Tim has kindly given me a fairly new MSR stove to take with me. I had tried to buy a Coleman’s stove in Philadelphia without success. We had a little test run in the park before saying goodbye. I am very grateful for all of Tim’s help. 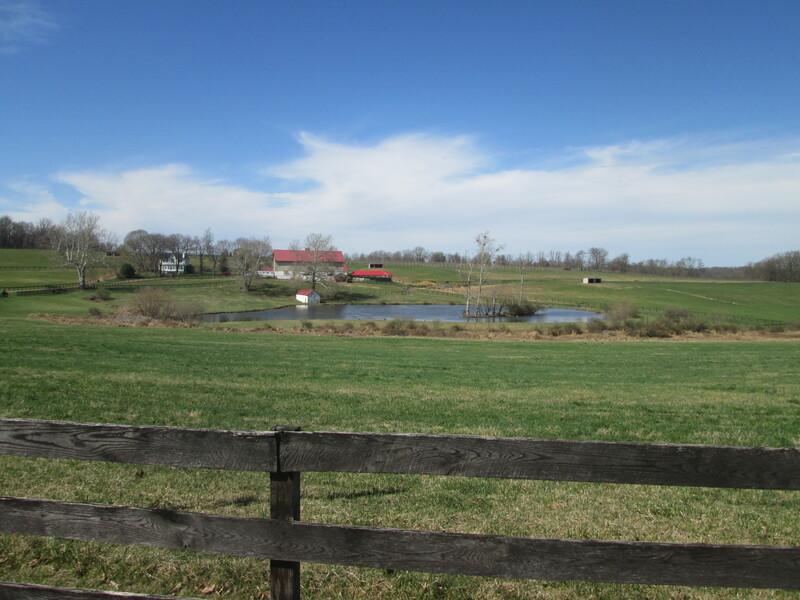 By the late afternoon I found myself in Lancaster County, real Amish country and no real plan on where I was going to stay. I got off the main road and went down a bit of a country lane. 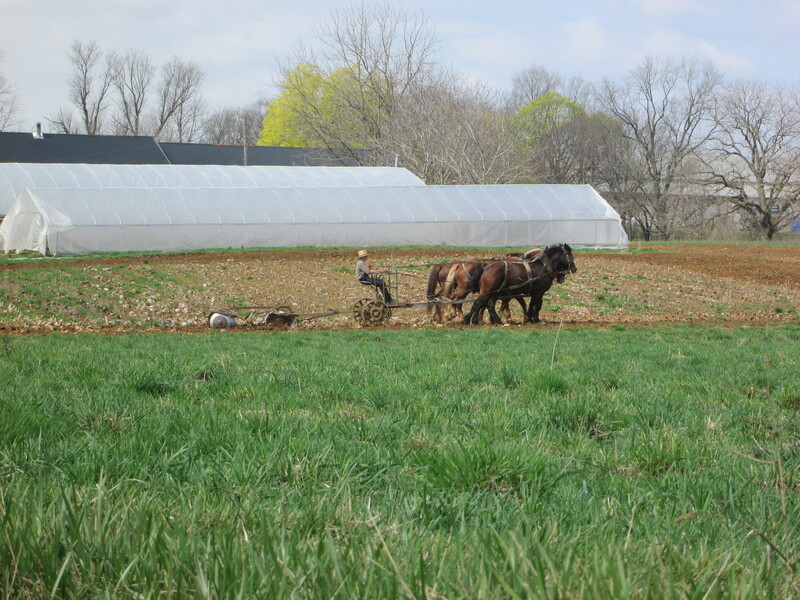 I could see some Amish in the fields working with a plough and horses. I came across a guy working in his front yard. I asked him if it would be possible to put up my tent for the night on the small bit of grass across the road from his house. 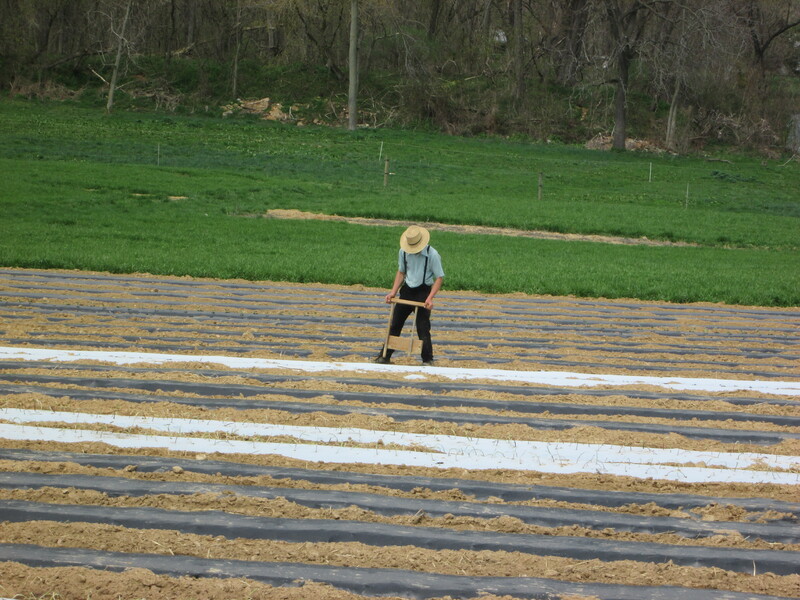 He said I would have to ask his Amish landlord who was working in the fields next door. But if I wanted to I was more than welcome to camp in his backyard. In the end I ended up dossing on his lounge floor. At the time, I didn’t realise I had knocked on the door of the Amish Mafia. I got talking to Calab and his girlfriend Renee. 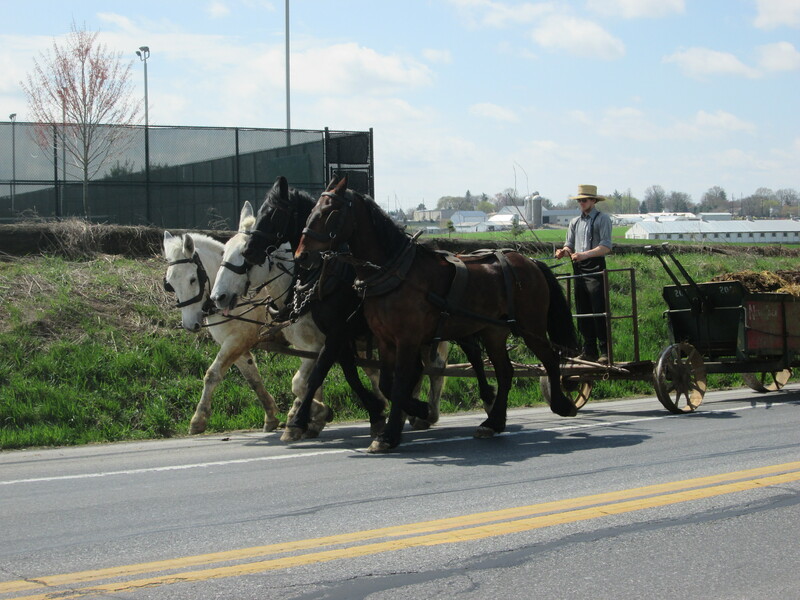 Calab sells horses and also has a buggy business where he takes tourists around to see the Amish. I don’t know how it came up but we started talking about the reality TV show Amish Mafia that is filmed locally. I said I had seen the excerpts for it but I never watch that rubbish because it is all staged and scripted. Calab was nodding his head in agreement. 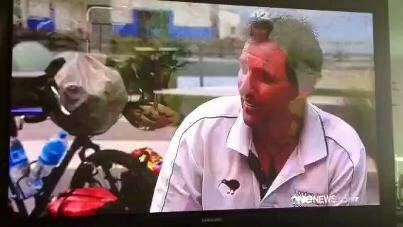 I then soon learnt that I was staying with a reality TV star. Calab was part of the Amish Mafia. He has been seen by 145 million people in 45 countries. I couldn’t believe it. How funny was that! He was very down-to-earth. We even watched an episode. bit of time to get back. More horses and ploughs were out working the fields. Again, I had no idea where I was going to stay the night. I pushed on to Columbia before crossing the very wide Susquehanna river. It was 4 p.m. and I just wanted to do as many km as I could. As I was cycling through traffic going into York, a lady flagged me down. I stopped and a couple jumped out of their car and said would I like to come back to their place for a shower, a hot meal and a bed for the night. I didn’t hesitate at all in saying yes. 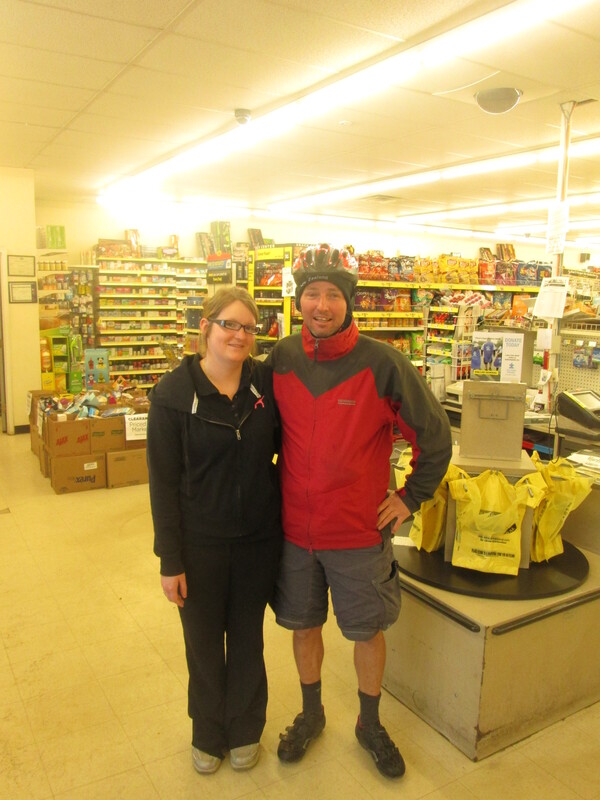 Julie and Steve are a wonderful couple and I was very grateful they stopped for me. They lived far away, so arranged for me to leave my bike close by at Julie’s brother-in-law’s place and would drop me back off in the morning. Steve was from New Jersey and was a retired teacher. He had a really strong accent. Julie was local and a secondary Art school teacher. We had a lovely evening. I was made to feel very at home. We talked travels and they had been to Europe a few times. Julie and Steve were super hosts and I was spoilt with a hot breakfast. Before I left we had a quick walk around the block. The neighbourhood had organised a yard sale which is similar to a garage sale and it sounds like most stuff gets redistributed amongst your neighbours. After Julie dropped me back at her brother-in-law’s to collect the bike and pick up where I had left off yesterday I got straight back on the 30 West (Lincoln Highway) I am going to stay on it for a while. It covers the whole country from coast to coast. It is the one down from the Interstate. Just makes things easier to cover good distances. and afterwards walked around the Military cemetery. 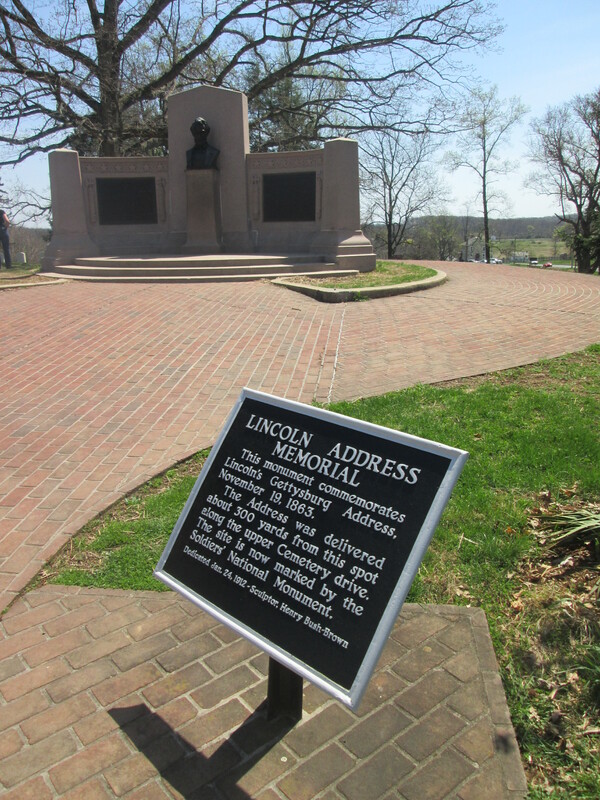 In all the surrounding fields are civil war monuments related to the battle. I cycled 20 km out of town and spotted a Lion’s Community picnic area with toilet, just below the road. It was perfect and I found a nice covered area where I could put up my tent later. It was only 5:30 p.m. and with still 2 hours of light a bit early. I had some dinner and while I was working on my computer a police car turned up. I thought here we go…………there is a sunset curfew on the picnic area. I just kept looking at my computer. The policeman used the toilet jumped back in his car and was gone. Being a very public area, I thought I might have had a few visitors. It was Saturday night as well so a few people would be out and about. 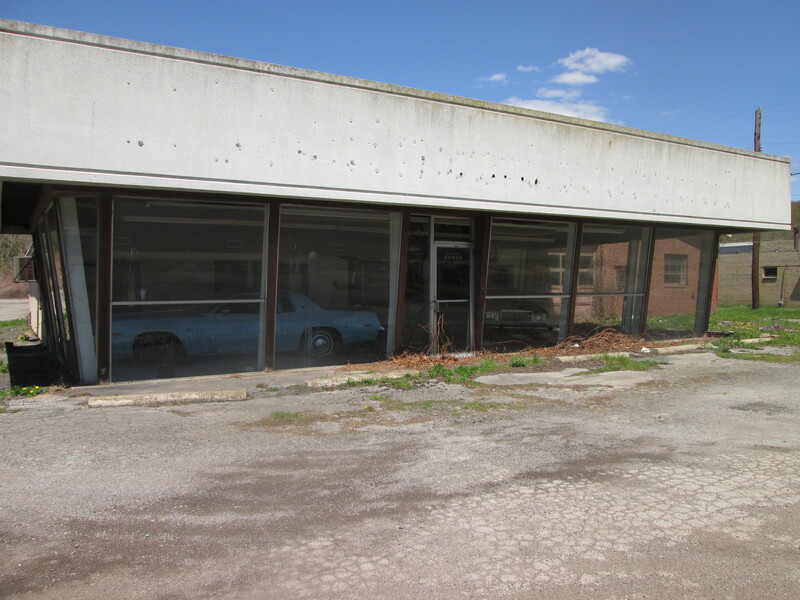 In the night I only heard one car drive in and they left……..probably looking for a good making out spot. Today was a killer day. I covered three counties: Lancaster, Adams and Franklyn. I had three good mountains to go over as well. Two of them were over 2100 feet. 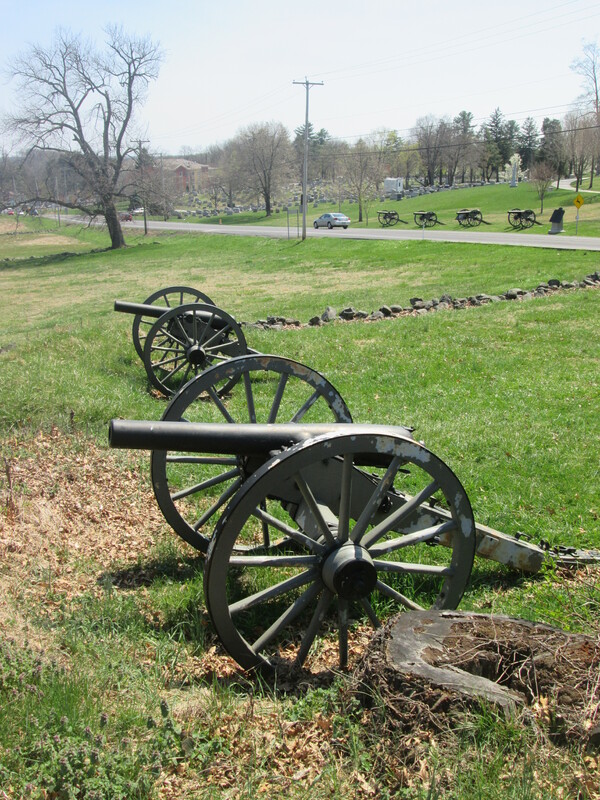 I cycled to Chambersburg first and that was mostly downhill. I am starting to get the hang of the set up here………..everything like supermarkets and fast food outlets are all about 10 km out of town. In the centre of town which is the historic part there is very little. I stopped at the supermarket on the way out looking for the reduced items and picked up some cheap pasta salad. I spoke to one nice lady who said she had passed me on the highway. When I reached the counter they knew who I was and where I was going. I had some lunch before attempting the first mountain. I am living off cheese and salami sandwiches and fruit. You get to see some interesting sights on the road. 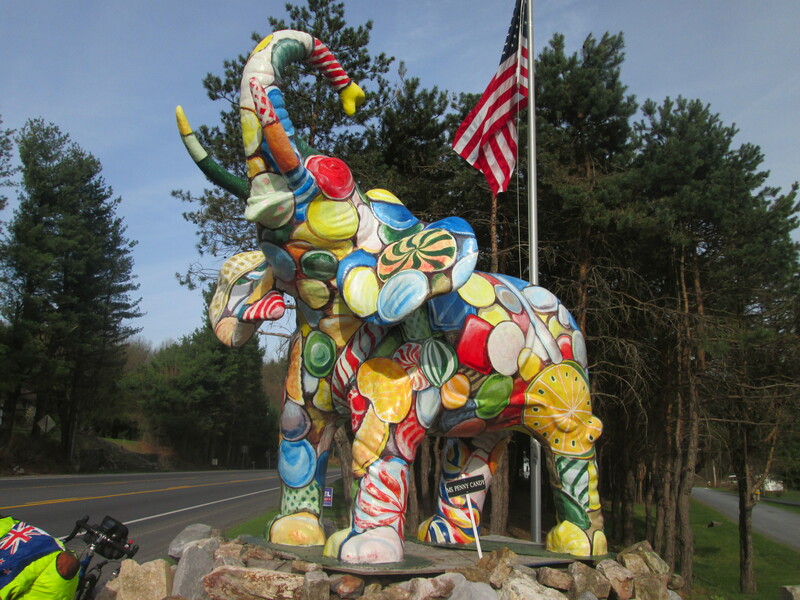 The elephant which was outside the Fudge factory. It was a really steep climb and towards the top I needed to stop many times. The road cut through a small sized forest with most trees without leaves. 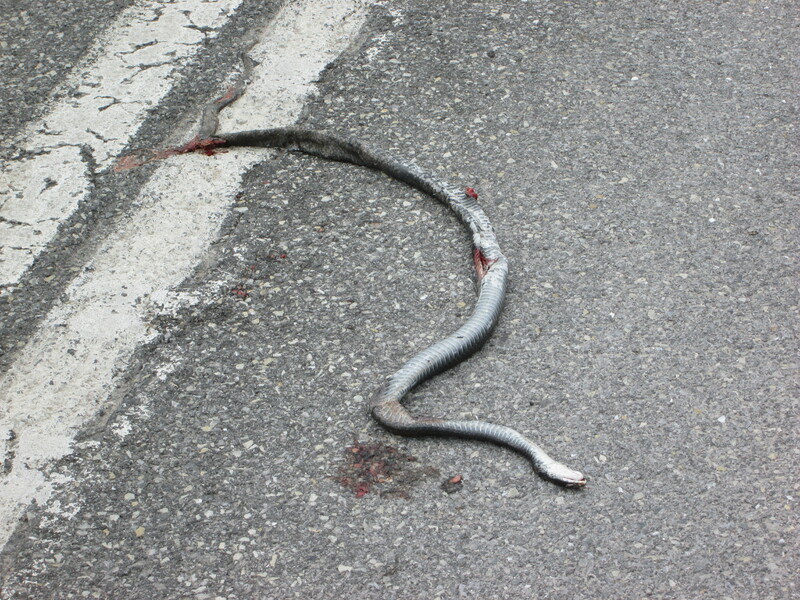 On the way up I saw my first dead snake on the road……………feels like Australia all over. There must be loads of deer in the forest because I say 5 dead ones on the road and 3 live ones in the forest. I saw my first road-killed Porcupine as well. I was pretty happy when I reached the top. I knew I was close because I could see a transmission mast which is always a good sign. Also just before the top, the temperature drops and you can feel the wind coming over. There were great views at the top and I was informed that I have to go over the two mountains in the distance. The second mountain of the day wasn’t too bad. I called into the pub and they kindly filled my drink bottles for me. We talked about climbing the next mountain and somewhere to camp out. I am keen for a campsite if there is one close by. Heavy rain is forecasted. The guy gave me a surprise when he said watch out for bears. I hadn’t expected them to be around this early on. I don’t even have the bear spray yet. The third mountain was tough and when I reached the top at 6:30 p.m. I had had enough. I had sweated so much and I was tired, wet and cold. There was a picnic area in the Sidling Forest Park. I went in there and set up camp under a picnic shelter. I made room by moving the tables out. I was just in time because the rain came and it stayed all night. I ate a yogurt, a banana, a cheese roll and then I went straight to bed. I’m glad to say I didn’t have any trouble with bears in the night. It did rain a lot. I got up at 6:30 a.m. It was a cold morning and the mountain was covered in fog. At least the rain had stopped. I am glad I made it to the top of the mountain last night because I enjoyed starting the morning with a downhill run. 8 km to Breezewood a bit of a truck stopping town. I am keen for some hot food, but decided to push on another 16 km to Bedford the county’s capital. Unfortunately I missed the turn-off and found myself on the bypass. I now know signs reading business is direction for the town centre. Couldn’t go back so pushed on and settled for a cheese sandwich instead. 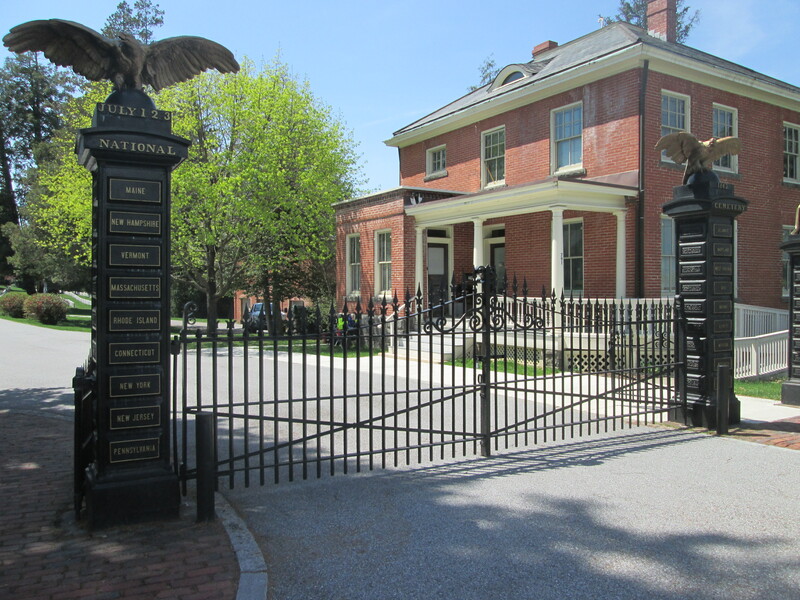 Just out of town I stopped at the Bedford Historical Society to view their civil war display. It was informative and I am starting to understand things a bit more. It was lunchtime before I left and a few km up the road was a sign for a campsite. After a few days without a shower, I thought it would be a good idea. I turned up but no-one was around. Thought it might be closed. Checked the bathrooms for hot water and all was good there so I set up camp. There is a thunderstorm forecasted for this afternoon as well as a tornado watch. So am keen to be sorted before it arrives. When the owner turned up and tried to charge me $24 a night, I told him it was too much on my budget and that I would have to pack up and leave. 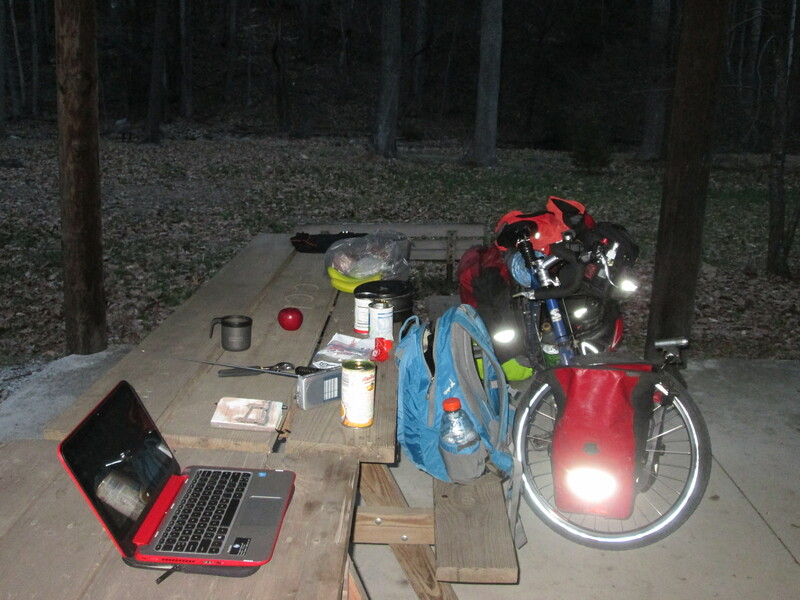 So I did and started heading a few km up the road to the Shawnee State Forest Park for the night. On the way I ran into another cyclist called Alex who was on his way to town. He said he was “stealth” camping just down the road and gave me directions if I wanted to join him and save the $21 fee for camping in the State Forest campground. So I did. It is in a clearing up a small dirt track and over a bank hidden from the road. It wasn’t too hard to find. Well after only 5 days I have already found someone to cycle with for at least a couple of days. I could keep up with Alex on the flat. As soon as we hit the hills he would pull ahead. Our first climb for the day was 2900 feet. Steep and winding and very tiring. Nice views at the top, but very windy and exposed and not to mention cold. We didn’t hang around at the top and headed down pretty quick. 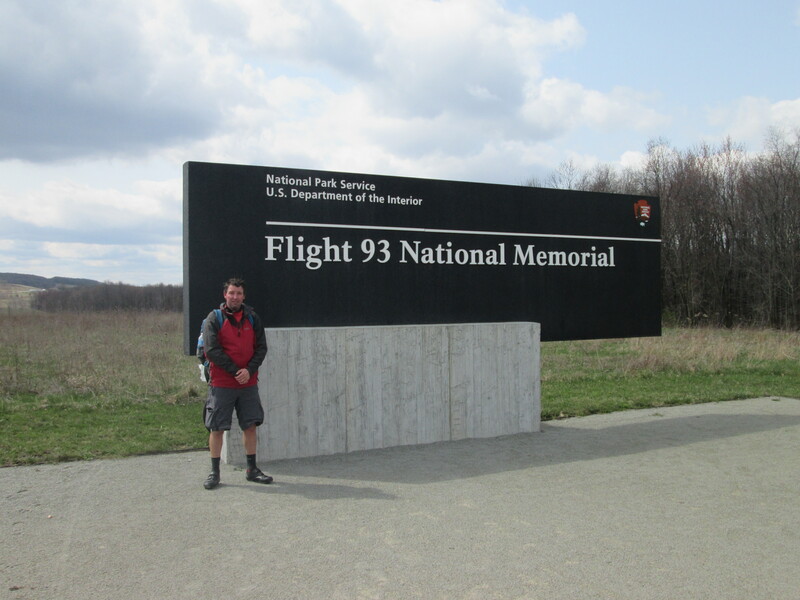 Yesterday we discovered that the Flight 93 memorial for one of the planes that went down in 9/11 is not very far away and we planned to visit. The map showed it right on 30. But when we arrived we discovered it was another 8 km off the Highway and our head and shoulders just dropped. 16 km round trip was too far to cycle. 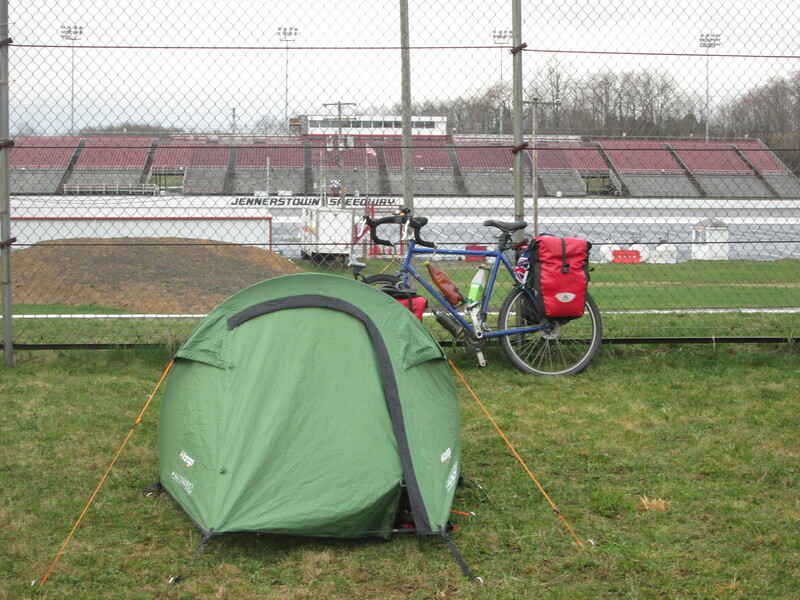 So we put our bikes behind a wall and hitched a ride up to the main site – 3rd car lucky. The guy was great and he even waited for us to walk around and then take us back. The memorial is complete but the visitor centre is still being built as well as some of the walkways. The crash site is marked by a large rock in a field. After the 9/11 memorial, we stopped at the first fast food restaurant in Jennerstown to get out of the bitter cold. We were happy we had got over the big mountain and weren’t too fussed about doing too much more today. 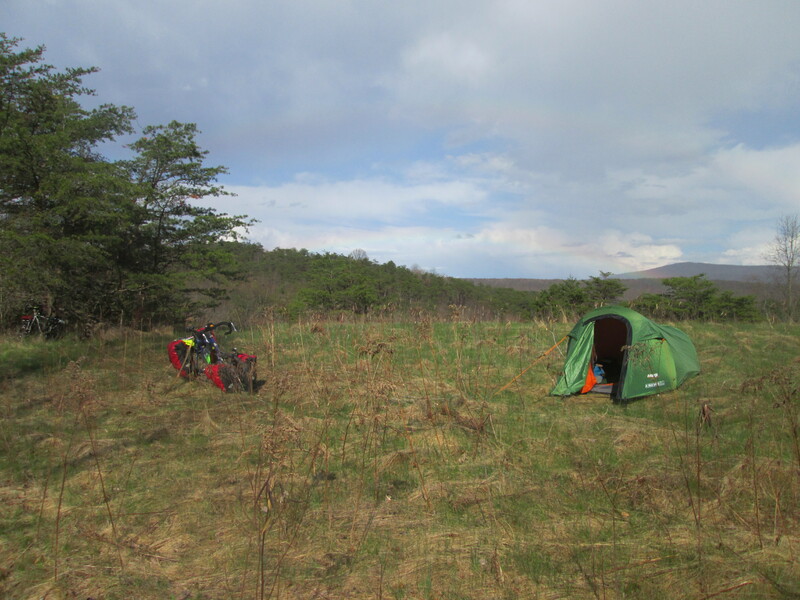 We spent about 3½ hours in Burger King before waiting till about 6:30 p.m. where we cycled a few km down the road to look for somewhere to camp. We tried the fire station first – no-one was around. We had a little look around town and found the Speed Way track. We just put our tents up next to the fence and this is where we camped for the night. There was a real strong wind. Thought the tent was going to take off. Always a little nervous as we are in tornado country. It rained a bit in the night as well. This morning we had a slow start while we waited for the rain to stop. When it did we packed up and went a mile down the road to the Dollar General. The young lady, Ashley, was so good to us. She let us use the microwave and we heated up some water and cooked some noodles. 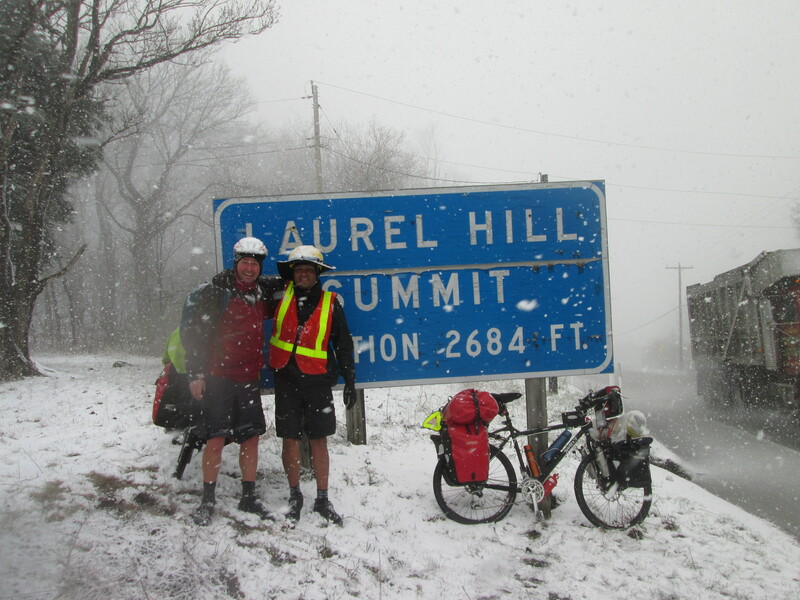 Just as we were leaving at 9 a.m. to start our climb up to the top of Laurel Hill 2684 feet, it started to snow. 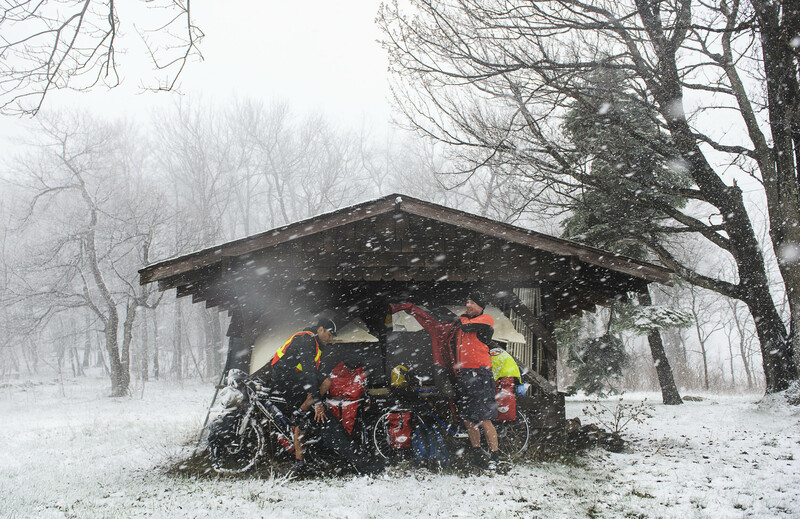 It was hard going and the higher we got the heavier the snow and the colder it got. Alex reached the summit first and when I arrived I found him being photographed by Brian a local reporter for the Pittsburgh Tribune Review, who couldn’t believe his luck. I did a quick interview with Brian who was interested with my story. We ended up making the paper that day. After taking some photos for ourselves and putting on some warmer clothes, it was time to go. The snow was really coming down and the temperature was below zero. It was a very cold and slow descent. The snow was a bit slushy. My chain got clogged up and I couldn’t change gears. By the time I got to the bottom of the other side I was so cold I stopped and went into the Forest Office to warm up. I couldn’t even speak to them properly because of the cold. While I was there, Alex sped past as he hadn’t seen my bike. I tried to catch him and it took a few good miles to catch up with him because he thought he was trying to catch up with me. I finally caught Alex when he stopped at a Giant Eagle supermarket. I was still cold so decided to keep going. We arranged to meet at the Mc Donalds 16 km up the road in Latrobe which is where we spent the afternoon warming up, drinking coffee and using the WIFI. Then at 5:30 p.m. Alex got a message from a “Warm Showers” host he had already arranged in Pittsburgh. 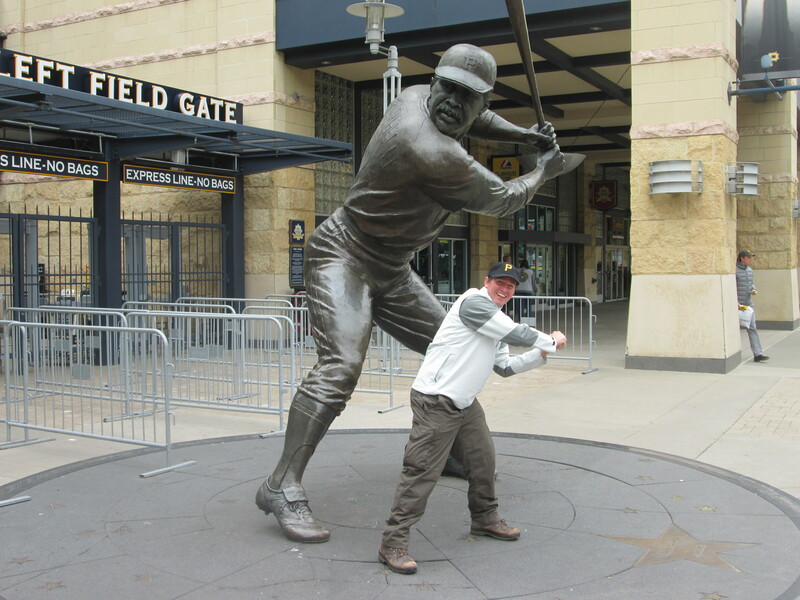 The message said that if we could get there by 10 a.m. tomorrow morning we could have box seats for a baseball game between the Pittsburgh Pirates and the Chicago Cubs. 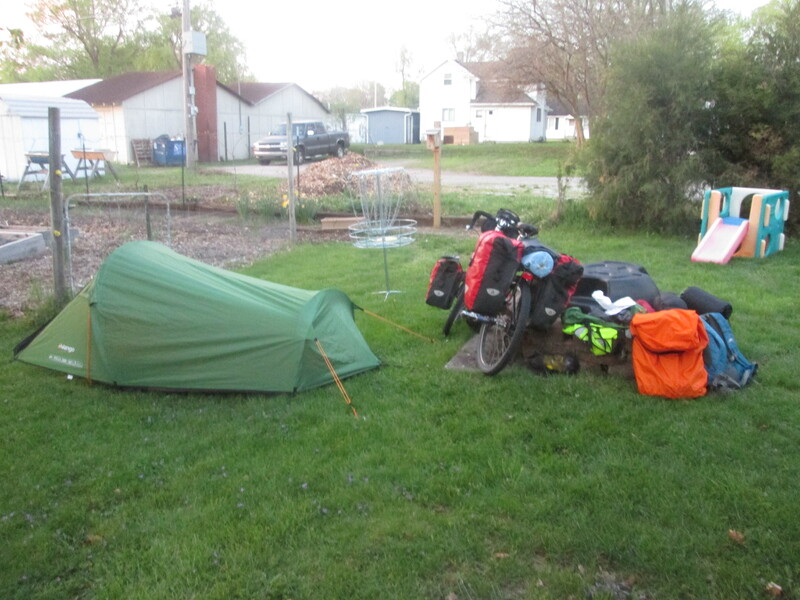 We pretty much packed up and started cycling then with the intent to get as close to Pittsburgh as possible and camp somewhere without putting up the tent and then get up early and cycle in. We were about 80 km away. It was still very hilly on a busy road. Not much fun. Just after 8 p.m. it was getting dark and cold. We were trying to sort out a motel. They were miles away. In the end our “Warm Showers” host in Pittsburgh offered to help us out by coming to pick us up. Alex was happy because he really wanted to make the game. We waited in Mc Donalds till 11:30 p.m. when Conner was able to pick us up. We were both very happy to be able to go back and have a hot shower. 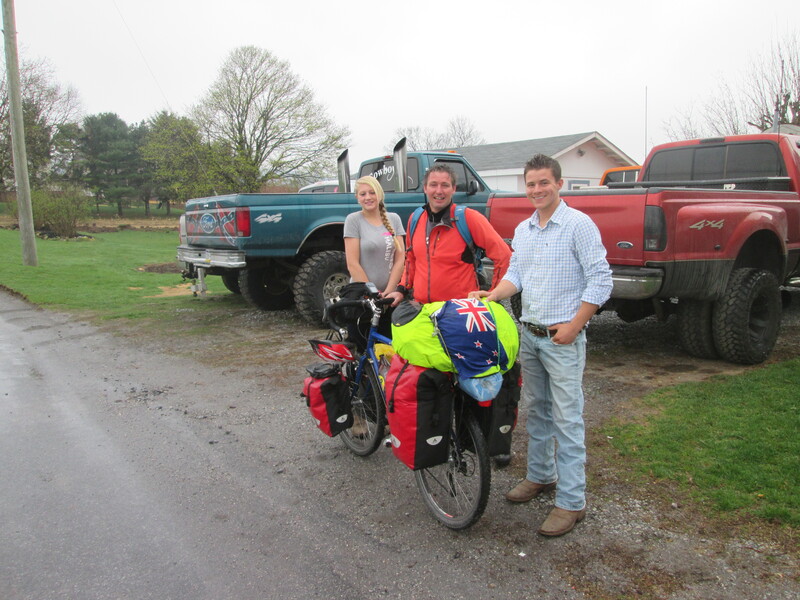 Conner is also an adventure cyclist who has cycled many parts of America and lives with his parents Randy and Jemma. We stayed up till 3 a.m. talking shop. What a great day. 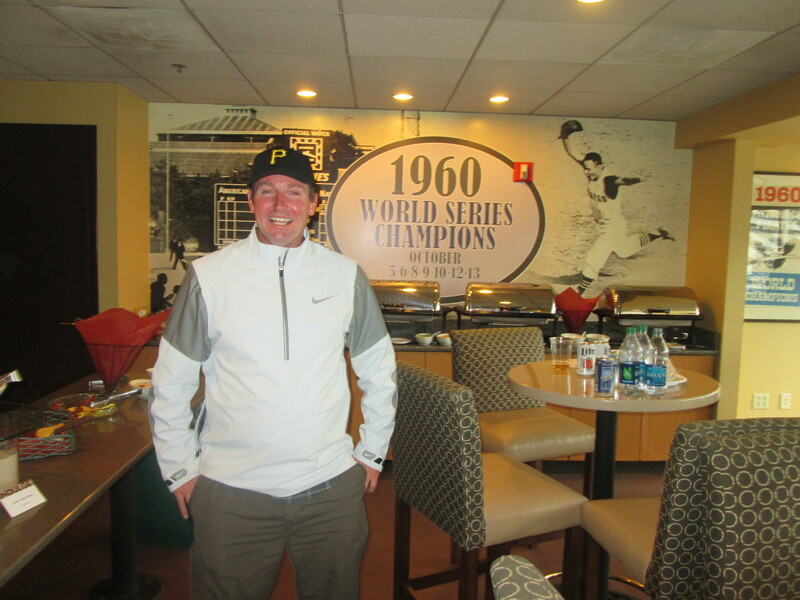 Randy came back from work mid-morning to take us to the baseball match We are so lucky as through his company we have Box seats in a full catered suite. We ate and drank all afternoon as we watched a good close game. Happy to say Pittsburgh beat Chicago 5-4. Afterwards we had a little walk around downtown. Didn’t take long as it is not a big city. Had some interesting things to see such as the PPG building and old bridges across the river. In the evening we went 5 minutes from Randy’s home to the boat shed next to the lake for a drink with some of Randy’s friends which was really nice. 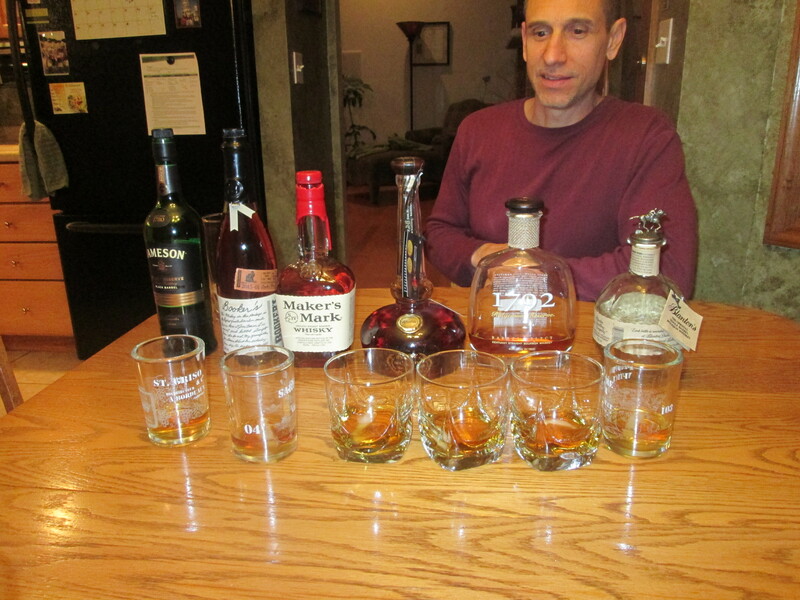 Afterwards we continued by going back and sampling half a dozen Kentucky whiskeys accompanied by a short introduction by Randy. After just two cycling days, Alex and I will go our separate ways. I will continue North West whilst Alex will head South. After 3 days off the bike my legs were still telling me no. It was a beautiful spring morning. A welcome improvement from the previous days. I was lucky that Randy cycled with me this morning for the first 40 km. Up to the Ohio river and Highway 65. We had some good steep hills to contend with but very nice cycling through a rural setting. After leaving Randy, the first town I cycled through was a very nice and tidy town called Beaver. Like many other countries the Americans are big on War memorials. I stopped for morning tea and looked at a few World War 1, World War 2, Vietnam and the Gulf War memorials. I then cycled beside the Ohio River for a while. Passed a massive power station and there were loads of very impressive iron bridges stretching across the Ohio river. Old brick buildings from past industry now left abandoned. Shortly after midday I crossed over into Ohio. The state of the road instantly deteriorated. I noticed every house was boarded up either for sale or half fallen down. 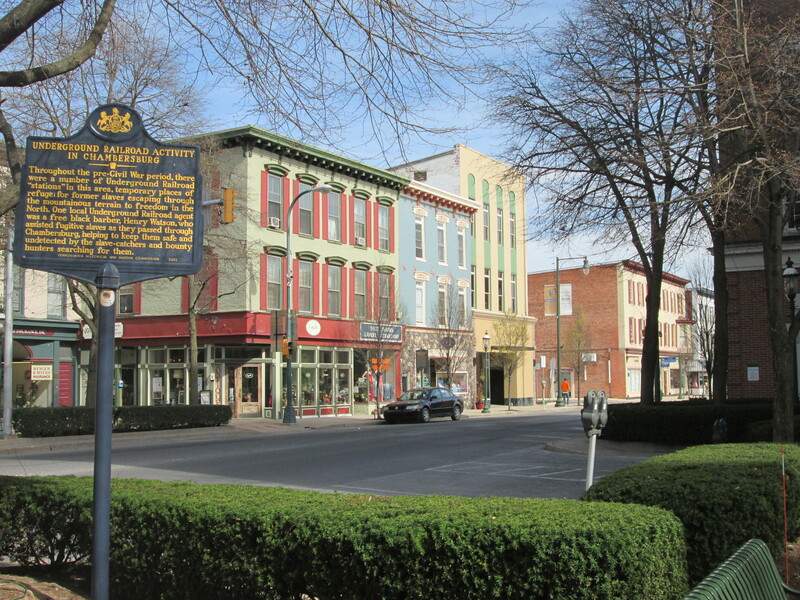 The first town I stopped at was East Liverpool. All the shops were closed and no-one was about apart from a few homeless and a few drunks. 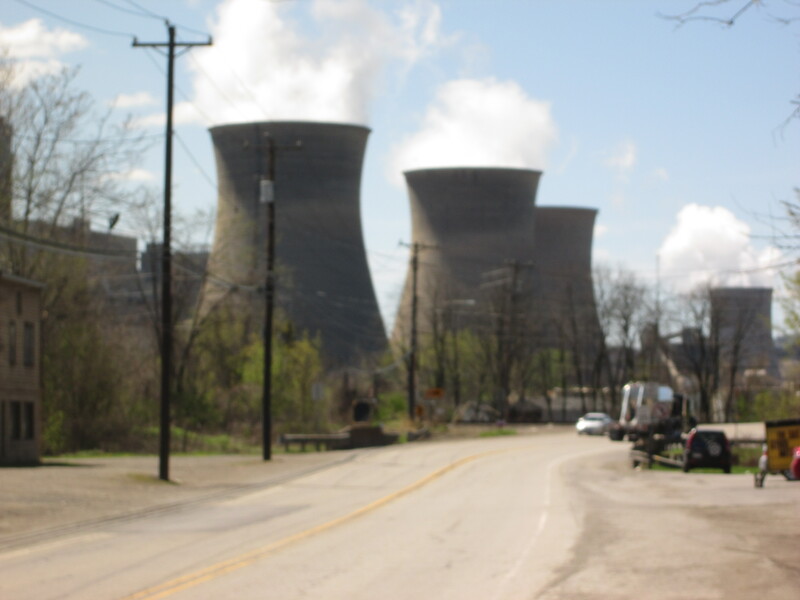 East Liverpool left me with a horrible feeling and I was happy to leave. I found a home stay 200 km from Pittsburgh for tomorrow night so I have to make sure I can make it by cycling at least 100 km today. Late in the day I stopped at a few places to find a place to camp. The best I got was directions for a small park just out of town which is where I have camped for the night. What a change in the weather. It was about 3 degrees all day and cloudy and cold. I was thankful for my woollen gloves and hat. My first stop for the day was Canton after about 3 hours cycling. I went into Mc Donalds on the outskirts of town to warm up. I have no shame taking my shoes off in the bathroom and putting them under the hand dryer to warm them up. Feeling revived I cycled into Canton and passed boarded up houses, houses for sale, groups of men standing around an open fire and dirty broken roads. I wasn’t getting a very good feel at all. There were some massive red brick buildings, no longer in use. Downtown was actually a lot more respectable and even the fact that Canton is home to the American football Hall of Fame did not entice me . The damage was already done. My destination for tonight is Wooster. Here I have arranged a “Warm Showers” host and a welcome place to be able to warm up again. David, Donna and their family were great hosts. We had a lovely evening talking travel after a wonderful dinner and I also go away with clean clothes again tomorrow. Wooster is on the outskirts of Ohio Amish. During dinner a very old looking horse and carriage came past. The other interesting thing I saw for the first time in my life was the toilet under the stairs – to save space it had a hand basin on top of the cistern. When you flushed the toilet the tap would automatically start so while you washed your hands the water would drain back in to the cistern for the next flush……….I thought what a great idea. Really nice day for cycling………..the sun was out making it a big improvement on yesterday and a lot more enjoyable. It was still a bit cold. I made good ground in the morning cycling 50 km in the first 3 hours. I played a bit of a game where I try and better or at least equal my hourly rate. I started with 17 km which is better than the normal 15 km. I hit 17 km again for the second hour and didn’t need all of the third hour to see me into Mansfield where I had a 2h 50 lunch break. I am seeing huge amounts of dead deer on the road but not so dead are the many Ground Hogs I see sitting on the grass bank which soon scamper away as I pass. The afternoon was just as productive cycling wise with 64 km in 3h 30. I think I had a kind wind. The highway is pretty flat as well making it easy to motor along. There are lots of crops around but I don’t know what they are because they have all been cut. At 5:30 p.m. I pulled into a rest area and this is where I am writing this part of the blog from while I decide what I am going to do for the night. I have given myself 3 options. One: sleep inside the main building which is nice and warm, Two: sleep outside underneath the picnic shelter or Three: go right over into the far corner and put up my tent. I will let you know in the morning what I did. In the end I modified option two. Around 9 p.m. 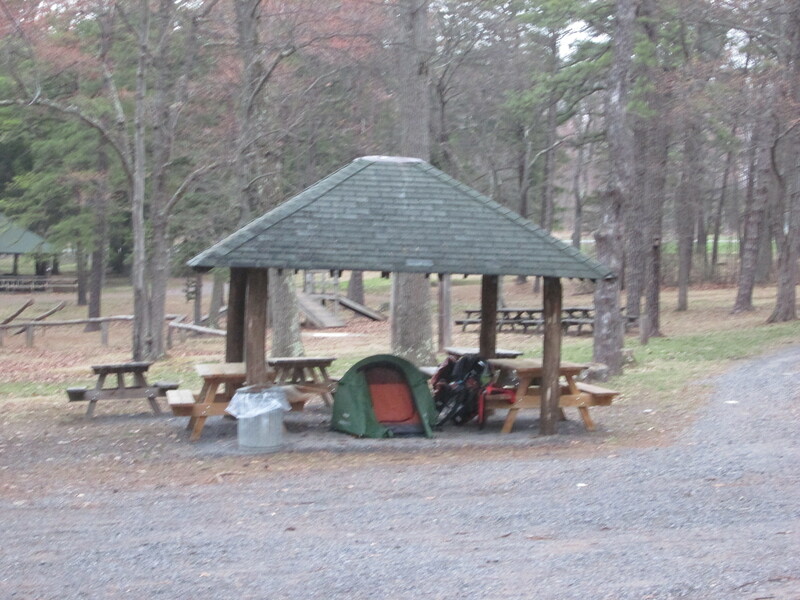 I went out and set up my tent on the nice grass next to the picnic shelter. 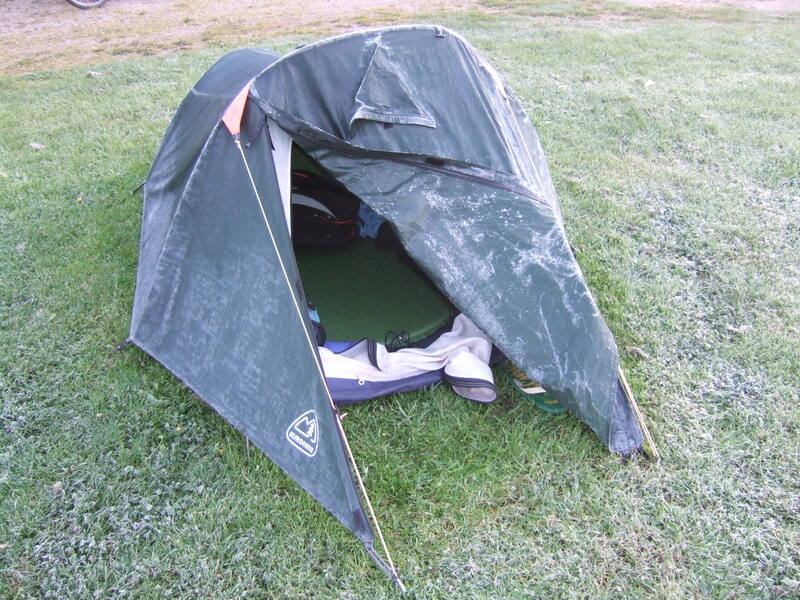 Just as well I didn’t sleep in the open because it was a cold night. Nobody bothered me however the traffic from the highway was a bit noisy. I was up at 5:50 a.m. for a quick getaway. I discovered the section of the Highway 30 I am currently cycling on, is forbidden to cyclists. Nice surprise this morning with my shortwave radio as I tuned into Radio New Zealand International. But unfortunately transmission ceased shortly after. I am loving these flat roads of Ohio. I am able to smash out the kilometres. In 3h 45 min this morning I did 78 km and am now having a 4-hour lunch break. Just have 15 km to cycle up the road to my “Warm Showers” host, Tim, for the evening. On the way up to Tim’s, I had two people stop me and ask where I was staying for the night. They both said I could have stayed with them if I had needed to. Tim is a young guy living on his own and is a computer programmer for a German company that makes machines for making auto parts. I put my tent up in his backyard. Had lots of wind and rain in the night. I got up at 6 a.m. and Tim had already gone to work. I have another host to stay with in Fort Wayne, Indiana tonight which is just over 112 km away. Have to make sure I am there by 5 p.m. as April and Nathan need to go out. 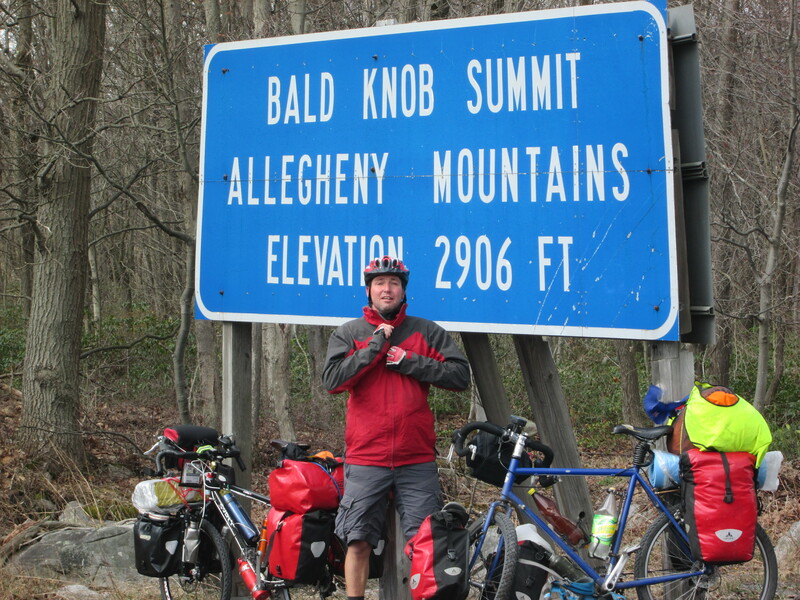 They have cycled across the States before. 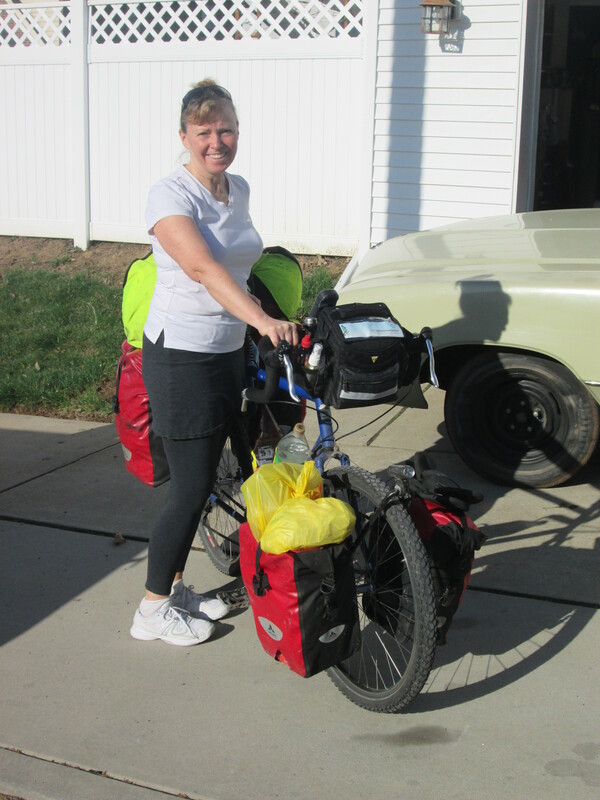 They made their own Panniers and now they have a successful business from it, which they are winding down. I am very lucky they are willing to host me as they are expecting a new baby next week. It was a cold morning………..at least it was fine. 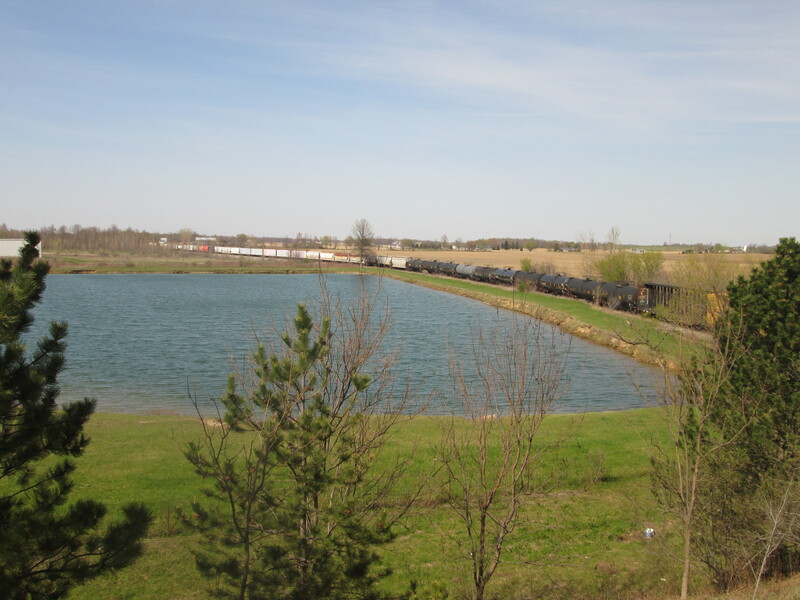 I took the Lincoln Byway for the first 60 km ……….. Nice scenic route, light on traffic. During the last few days I have noticed a strong smell of pesticides in the air which has probably been used on the crops. April spoilt me with a great pancake breakfast. I didn’t really have much of a plan so I decided I would have an easy day. I cycled into downtown to have a little look around. There were some 20 storey buildings among some old brick ones. I decided to stay in Fort Wayne another night. I didn’t want to burden April and Nathan even though I’m sure it wouldn’t have been a problem to stay an extra night with them. So I arranged another “Warm Showers” host with a lady called Jenny. Instructions were that I could chill out in her Gazebo and she would be home at 4 p.m. I followed a nice river trail up to Jenny’s and then got lost until the kind women at Dairy Queen printed out some directions for me. First lot had me going 9 km down the road. Luckily I realised it was Somerset Ln not Avenue that I needed to go to. Next set of directions was only 8oo metres away. Jenny is a nurse and ex-cycle tour leader. 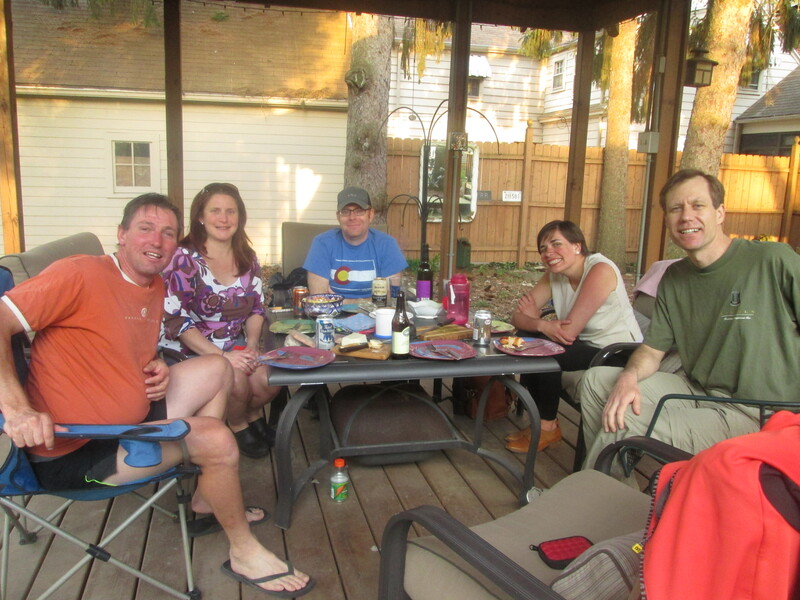 She invited a group of her friends over and we had a very nice BBQ dinner to complement a very social evening. Apart from Jenny’s brother who called round to say hello – he had holidayed in NZ a few years ago – everyone else were cyclists. In fact they all came on their bikes. It was nearly midnight and a few beers later when we finished . I was a little hungover this morning. I made the decision I would push on today. I have arranged accommodation for the next 3 nights. Today is an easy day with just 70 km down the road. But the following day will be big at 130km. I finally got away at 11:30 a.m. It wasn’t too hard finding my way out of town. 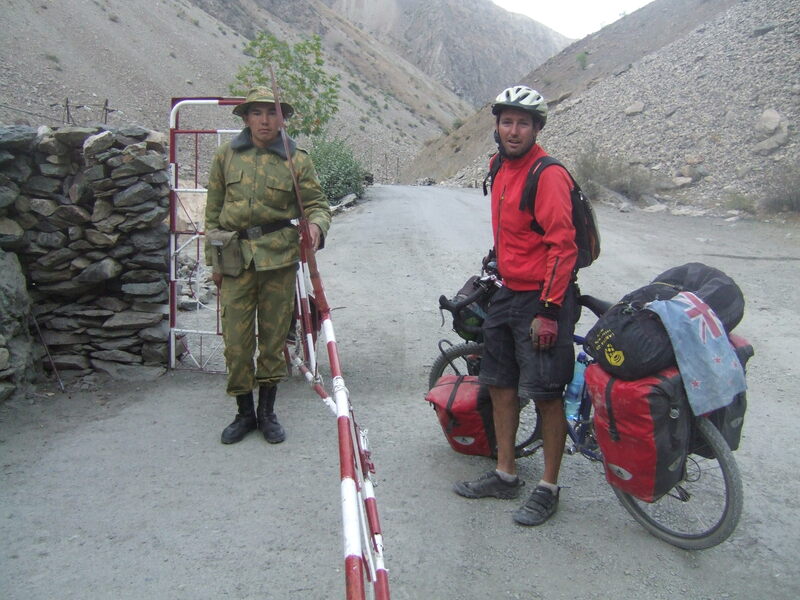 Along the way I met two road cyclists who showed me a more scenic route. I rode with them for about 15 km. They kindly helped protect me from the wind. They made me work as I tried to keep up with them. I am finding a lot more people are approaching me now to ask about my trip. Part of that could be to do with the nicer weather, where people are more willing to hang around and talk. Earlier today a guy stopped me and said if I wanted to call round at the Firehouse in the next town where his son worked and the local firemen were putting on a community dinner. He kindly said he would pay for my meal. I would have loved to but declined because I wanted to get to my “Warm Showers” host James & Anne before it was too late. Yesterday I bumped into an Irish guy while cycling through Fort Wayne. Few hours later he sent me a message on Facebook inviting me down to the Irish bar where he works for a beer and a meal. Unfortunately I couldn’t make that either. My hosts James and Ann have apologised for being bad hosts because they have gone out for the evening. Really – I am just very grateful they fed me before they left and have let me put my tent up in their yard. 7 a.m. and I was moving. Was a nice quiet Sunday morning. 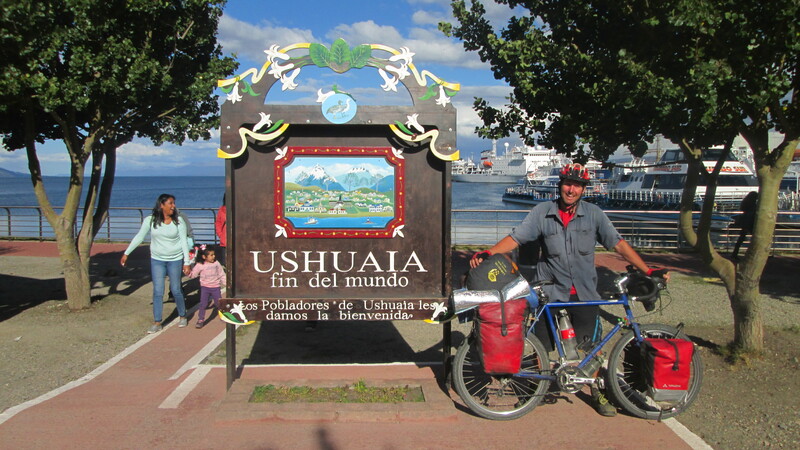 By early afternoon I had reach Valparaiso. Roads were pretty flat all day and lots of fields. I used “Warm Showers” again and my host Mike and his wife had a lovely house with an awesome view backing on to a small lake. We sat out on the covered deck and watched a stork move its way around. No signs of any beavers which also live in the lake. That evening I discovered I had crossed a time zone when I was told the time was only 9 p.m. and I looked at my watch to see it was 10 p.m. Confusingly Indiana is split down the middle and has two time zones so I needed to put my watch back 1 hour and just gained a sleep in. I was lucky that just as I left this morning the rain stopped. Jumping back on the highway I very quickly found myself on the outskirts of Chirgo (about 70 km from the centre) for the next 50 km it was just a constant continuation of strip malls one after the other. 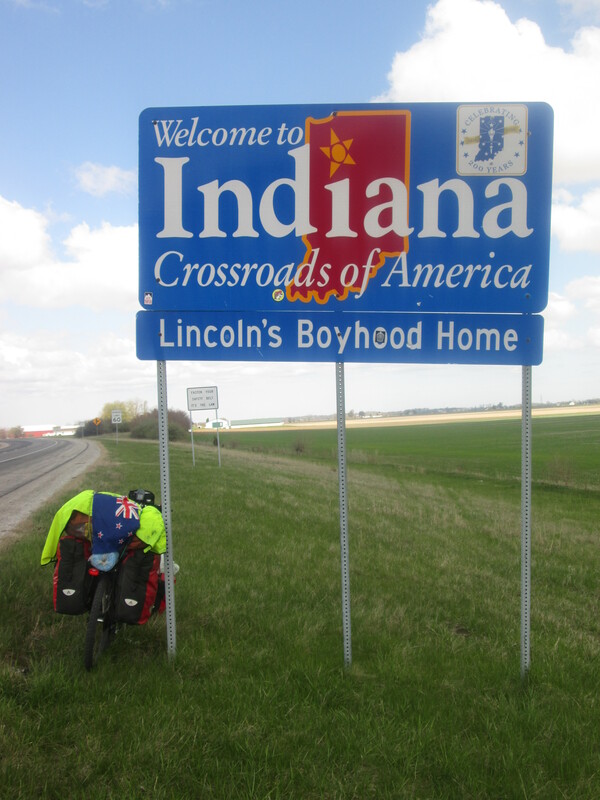 When I got to the Indiana/Illinois border. I stopped for the customary photo. A local guy called Clint came over and had a chat. He asked me if I was cycling on the 30 because he didn’t recommend that I cycle through the next town Chicago Heights because it was a really dangerous town where no-one works and there are lots of shootings. He said because it was a nice day, lots of people would be out on the street. He said he had heard of white people being burned while walking through. 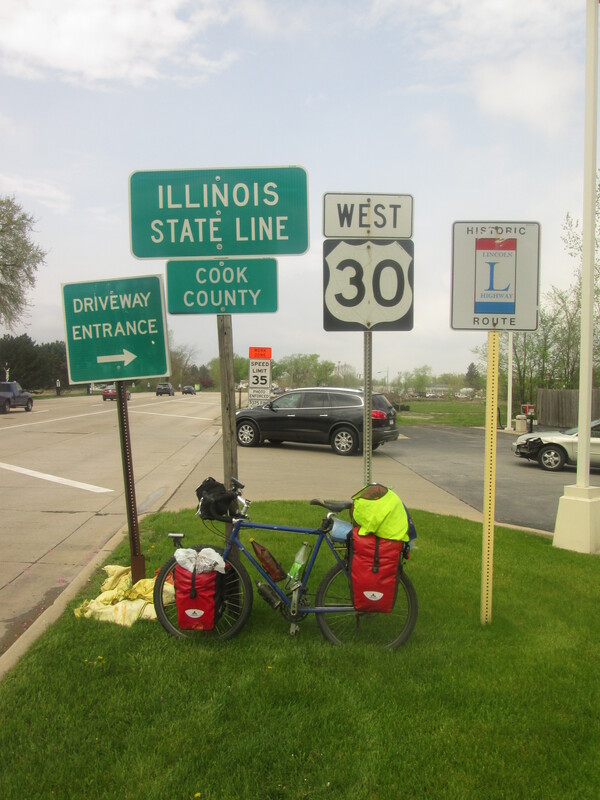 I’m not normally one for doing detours………..but I did do a bit of a detour cycling around Chicago Heights. as to be able to go into Chicago tomorrow. It was a good day not to be cycling. Overnight storms and a wet and cold start to the day. 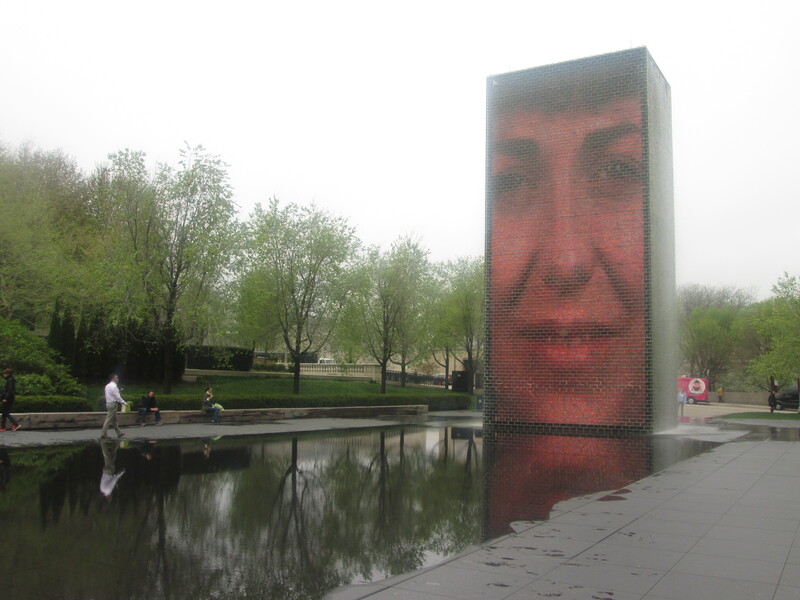 I took this great opportunity to go in to and explore Chicago for a few hours. I got a lift in with Debbie. In peak hour traffic it took us over two hours to do 70 km. Debbie dropped me close to the lake on the North side. I then walked along Lake Michigan towards the centre of Chicago. The city was covered in fog and I could only see the first 10-15 stories – couldn’t see anything above and some buildings had another 85 stories. When I got to Navy Pier. (old US submarine base) I went for a walk out to the end. Now just shops, fairground rides and a function centre. Navy Pier was only a few blocks from the magnificent mile, which I walked south for a few blocks. Passing Trump Tower, Chicago Tribune and Michael Jordan’s steakhouse. The culture centre housed in the old library with free exhibits was interesting. The building itself was beautiful. 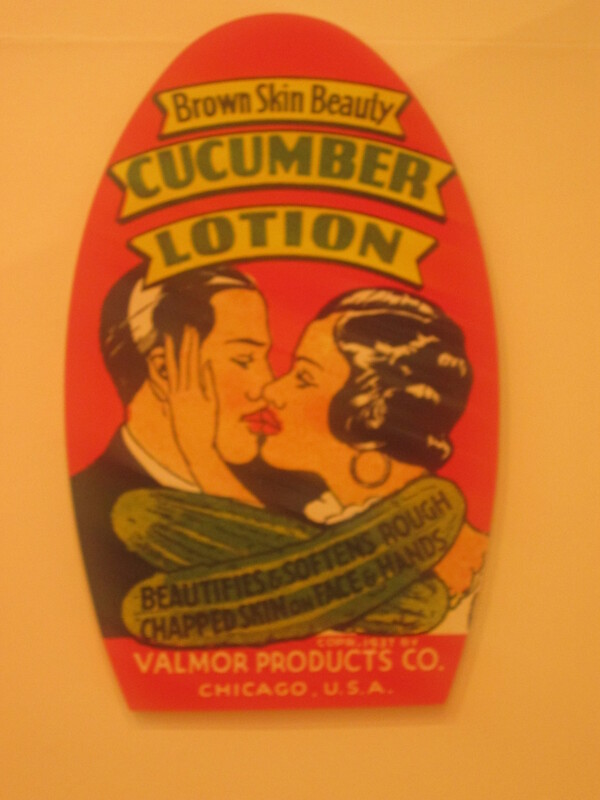 One of the exhibits was 1920’s advertising – Love sells. Across the road from the culture centre was Millennium Park. Relatively new having been built over the old railway yards. Some of the sculptures were very good. 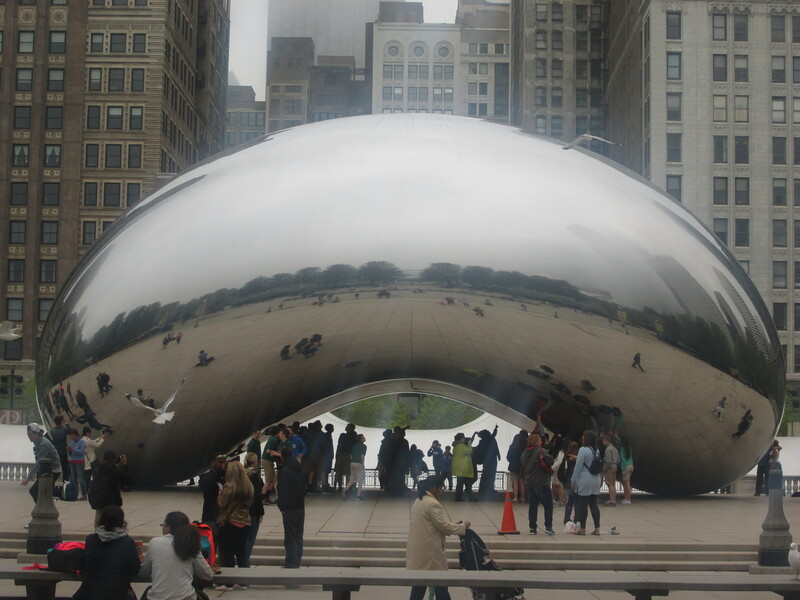 The bean looked the most popular.